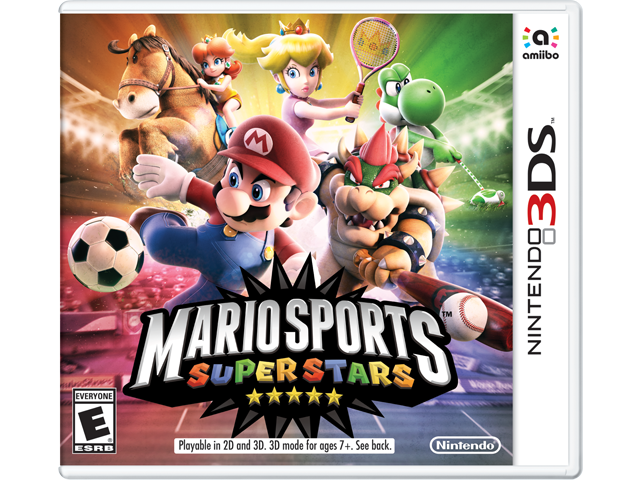 Five full-on sports—Soccer, Tennis, Golf, Baseball, and Horse Racing—bring the challenge and depth you demand to Nintendo 3DS™ systems. Take on friends and rivals in local or online multiplayer*, hone skills in training, or tackle single-player tournaments. Whether you pick Mario™, Waluigi™, or one of sixteen others, you're on the road to superstardom! Before long, you'll have mastered the ins and outs of each sport: learn when to use an infield shift in Baseball, change your team’s formation in Soccer, and more. Even Horse Racing is surprisingly deep! Build a stable of horses and train them well to win the day in the first-ever horse races in series history. But remember: these aren't normal sports—they're Mario Sports™. Expect unexpected thrills and power up to stomp the competition. Five full-featured sports: Soccer, Tennis, Golf, Baseball, and Horse Racing! Play as your favorite Mario characters, like Yoshi™, Bowser™, Peach™, and more!